Are you sick of trawling directories looking for honest, hard-working suppliers and installers of high-quality patio awnings in the local area with no luck? Look no further as Samson Awnings & Terrace Covers have the answer! 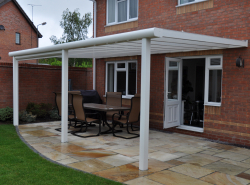 Samson Awnings & Terrace Covers are leading suppliers and installers of domestic and commercial sun shading equipment in the Leicestershire area. We have a showroom in Wellingborough, Northamptonshire with fully operational models, fabric samples and professional knowledge from our experienced sales department. We welcome you to enquire about any details you require and will gladly provide you with a free survey and prices. Samson Awnings & Terrace Covers specialise in the sale, supply, installation and servicing of patio awnings for commercial or home use. 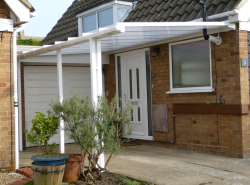 All of the Leicester Patio Awnings supplied are fully retractable and are available with full cassette, semi cassette or open cassette covers to protect against the sun. 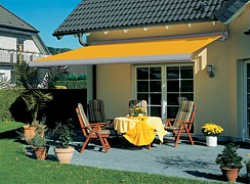 This enables you to enjoy the shade and shelter which a patio awning selflessly provides. Whilst being able to effectively offer sun protection, our patio awnings are available with a variety of different material covers to offer effective shade against sun glare and the rain. A waterproof patio awning allows you to remain outdoors even during the rain keeping your patio dry and your mind at ease. 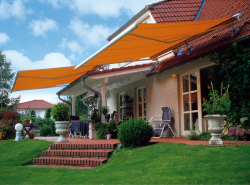 Sun Awnings can be the difference between a relaxing, accommodating outdoor space and an area spoiled by a powerfully strong sun. Samson Awnings & Terrace Covers supply and install a range of sun awnings suited to blocking out the powerful heat from the sun without losing the natural light. All of our patio cover products offer high quality sun shading at extremely affordable Samson sun awning prices. Even though sun awnings are designed for use to block the sun, they are also designed to withstand light rainfall when used to cover an entertainment area at night. With in-built tilting halogen lamps, our sun awnings with lights can be quickly extended and brighten up any area with the simple click of a remote control handset. Terrace & Patio Covers are the ideal solution to all weather protection for both domestic and commercial environments. With their unique adaptability, our solid structure canopies can be installed almost anywhere and everywhere. No product demonstrates this more than our Samson Piazza Patio Cover System. In a commercial environment our terrace covers allows pubs, restaurants, community centres, schools and more to fully take advantage of their external areas and allow your guests to fully embrace the natural light and enjoy the fresh air whilst still being protected from the weather. 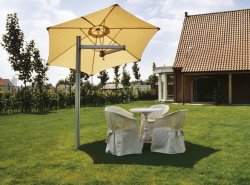 We specialise in the supply and installation of two types of large umbrellas & giant parasols. Samson Awnings use high quality manufacturers to provide the optimum level in performance, durability and comfort for your money. Each manufacturer we deal with are handpicked and we only supply and install the highest quality products.